Leaf of arbor plant Morus alba L. of family Moraceae. Silkworm breeding regions in south of China. Less smell and bland taste, slightly bitter and astringent. 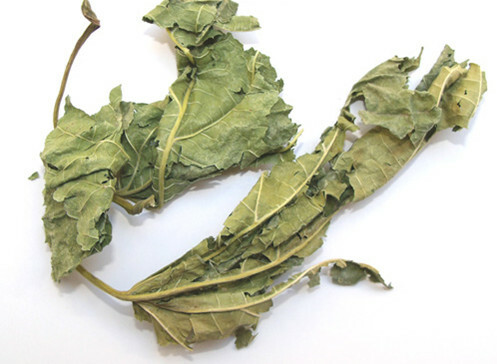 Complete leaf, big and thick, yellowish green color, with pricking quality. Sweet, bitter, cold; lung and liver meridians entered. Disperse wind-heat, clear lung-heat and moisten the dryness, subdue liver-yang, clear liver-heat and improve vision. For it has a mild action of dispersing the exterior pathogens, it is often used together with Bo He to dispel wind-heat for a strengthened action. Being able to clear lung-heat, it is used with Ju Hua for wind-heat externally and lung-heat internally leading to fever, itching throat, cough and also used in conjunction with sore-throat relieving and cough-stopping herbs such as Jie Geng and Xing Ren to achieve the effect of dispersing wind-heat to release exterior externally and clearing lung-heat and eliminating cough internally, just as Sang Ju Yin in Wen Bing Tiao Bian. Being bitter and cold to clear lung-heat, sweet and cold to cool and moisten the lung, it is indicated for lung-heat or dryness-heat hurting the lung, manifested as cough with little yellow and sticky phlegm, or dry cough with no sputum. 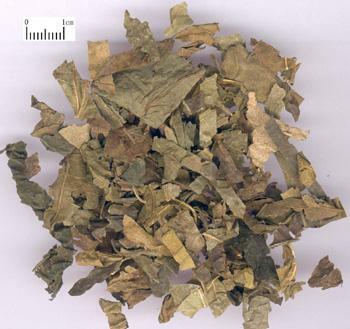 For the less serious syndrome, it's often used together with herbs which can clear lung-heat, resolve phlegm and relieve cough such as Sha Shen, Zhe Bei Mu, Xing Ren, just as the Sang Xing Tang in Wen Bing Tiao Bian; for the serious syndrome, it is often used in conjunction with yin-nourishing and lung-moistening herbs such as Mai Dong, E Jiao, just as Qing Zao Jiu Fei Tang in Yi Men Fa Lu (Principals and Prohibitions of Medical Profession). Being able to remove liver-heat and moisten the yin to improve eyesight, it is often used together with Ju Hua, Xia Ku Cao which can remove liver heat and improve eyesight for liver-fire flaming up leading to blood-shot, painful eyes with profuse tears. It also can be used together with herbs that can tonify essence and blood such as Hei Zhi Ma, Gou Qi Zi for the essence and blood deficiency of liver and kidney to improve the eyesight. Also it's often used in conjunction with liver-heat-removing and liver-subduing herbs as Ju Hua, Shi Jue Ming to treat the dizziness and headache caused by liver-heat. Besides this, being able to cool blood and stop bleeding, it can be used for bleeding due to blood-heat such as hemoptysis, epistaxis and hematemesis. Decoct 9~15 g or make it into pills or powder. Besides this, decoct it with water and wash the eyes with the decoction externally. Sang Ye, processed with honey, can strengthen the action of moistening the lung and relieving cough. So Sang Ye processed with honey is often used for cough due to lung-dryness.